A sparkling violet fragrance. A twist of the iconic violet with a sparkling touch of blackberry and musk. The scintillating and youthful fragrance is a feminine scent that captures the sophistication of Balenciaga Paris with an enticing, floral musk. Plain speak translation: a sort of mash-up between a blackberry musk and a traditional powdery rose-violet. The top notes are sparkling, fruity and sweet but not too fruity and sweet, with lots of peppery citrus. I found it quite fun — it makes a great first impression on paper and on skin. The dry down recalls the original Balenciaga Paris fragrance: muted dry woods, even more muted (and clean) patchouli, a bit of musk, all smoothed over with a light dusting of powder. It's a bit more transparent than Balenciaga Paris, and a bit less earthy, and a lot less creamy. Arguably, it's also a bit more youthful and a bit less distinctive. 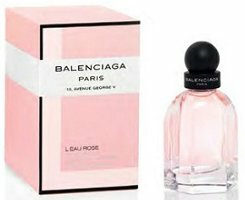 Balenciaga Paris L'Eau Rose was developed by perfumers Olivier Polge and Domitille Bertier; notes include blackberry, violet, rose, patchouli, cedar, musk and cypress. It is available in in 50 ($90) and 75 ($115) ml Eau de Toilette. It doesn't officially launch until March, but it can be found now at Nordstrom. 1. Wang's appointment has been confirmed by the brand's owner, luxury group PPR (they also own Gucci, Yves Saint Laurent and Bottega Veneta), and his first collection will reportedly show at Paris Fashion Week. Or maybe it already did — ya'll know that I have no idea when Paris Fashion Week might be. Before all this, Wang had been rumored to be working with Puig on a scent under his own name. 2. Or maybe there is still all sorts of hoopla to come when L'Eau Rose officially launches in March; nobody tells me anything. 3. I do like the packaging for L'Eau Rose, even if it's not as tempting as that for Florabotanica. The cream and rose outer box is lovely, and the matte black cap (which not everybody appreciates, if the comments here are any indication) keeps it from looking too girly and pinkified. Both look more elegant in person than in pictures. 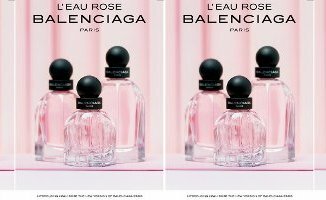 I found both Balenciaga Paris and L’Essence to be really lovely and well worth owning in their own right. I really look forward to trying L’Eau Rose. Blackberry musk/rose and powdery violet are still two of my favorite fragrance categories, and this sounds like just the thing when spring arrives here. Thanks for an encouraging review for a flanker I actually was anticipating, Robin. It is nice to finally have a flanker that sounds well worth trying. * This and the new Bottega Veneta are now on my must sample list. * I still can’t bring myself to try Chanel Coco Noir or the muskifying of my beloved Guerlain L’heure Bleu. I have a feeling it might be fun to layer L’Eau Rose & the original BP? My sample of BP is too old to bother with so I didn’t try. I’m just cynical enough that I found a quick spray of Coco Noir on paper enjoyably amusing. This is way better than that, but so is nearly everything else. ugh, really hate the clothes of Alexander Wang. It’s always interesting to see how designers neglect or foster their line’s fragrances. I guess I’ll have to go to Neiman’s to try this – sounds nice enough. I don’t know his clothes! And didn’t know NG’s either, so sort of all the same to me. I do not know enough about the contractual arrangements between most designers & owners & fragrance companies to say — there is probably a reason why NG seemed to take such a huge interest in the fragrance line and why some other designers seem to ignore it entirely. I have some T by AW I enjoy wearing around, but in terms of the haute collection, yeah–it’ll be a tough act to follow, after what Ghesquière did with the brand. Agreed; I think he’s the most overrated of the new crop of designers today. This might seem too conservative other than the top notes — the top notes are possibly the least buttoned up of the 3, but the dry down might be the most. I’m curious about what you think makes B Paris a conservative or buttoned-up scent? I’m trying to understand what qualities it has to make it so as opposed to the category of clean or feminine for example. Generally just that it’s rather quiet, both in terms of sillage but also (to me) in character. Compare to say, Tom Ford Violet Blonde, or even another relatively muted violet with weirder characteristics, like Comme des Garcons Stephen Jones. It’s elegant rather than fun — does that make sense? Yes, that makes perfect sense. Thank you! Mm, that’s too bad–I too lamented Balenciaga Paris for being beautiful but too conservative, would have been glad for a livelier take on it. Well, with the top notes, it is livelier…just not sure the dry down is. Try it! Ah ok–it’s true that having a less interesting base strikes me as a fairly common and potentially more forgivable offense than some other kinds of flaws. (We won’t name names, but I can think of some perfumes I like that I would describe this way!) Will give it a try! Thanks Robin. Definitely on my try list, though musk always gives me pause. That’s hard — musk is in everything. Especially these clean laundry musks, which I dislike second only to the really sweet ones. Not sure if my skin amps them or my nose is extremely sensitive to them, but they overwhelm everything else for me. White musk is very popular these days, it’s true. But I do think there truly is musk in nearly every perfume made. Lol. Untitled No. 8 was a very ferocious scrubber on me, too, and this from a lover of MKK, MN and MR. I want to sample Musc Tonkin but am afraid it will be like Number 8. *shudders* I don’t think even blackberries would have made that one work on my skin. I only sniffed Untitled no. 8 from the vial; I didn’t have the nerve to put in on my skin. My impression was “portable toilet”. Yuk!! Musc Tonkin is nowhere near no. 8, at least to my nose. It is a little bit salty, and reminds me of the drydown of a vintage perfume (not necessarily a particular vintage perfume, just that it has a vintage perfume feel to it). I did not find it repellant at all. I didn’t love it, perhaps because it felt more like the drydown of a perfume than like a complete perfume in itself, but I didn’t hate it. I will probably give this a sniff. I like B Paris, although I’ve mostly relegated it to room spray. It’s not quite interesting enough to want to wear it. But blackberry holds some interest to me–if it has some genuine sour fruitiness to it, rather than frootiness. I agree with the anti-musk trepidation voiced above, though, too. So, worth a sniff, but not high-enthusiasm. It’s not exciting, but it’s so nicely done. Really enjoyed wearing it again while writing this, although the top notes of my sample have gone off. You know, I really do enjoy it as a room spray! Seems very fresh and clean without smelling like I just did laundry. I know Kevin does that (uses things he doesn’t wear as room spray) and I don’t know why I don’t. I don’t know that I’ve ever tried a perfume with a blackberry note. I never smell Mure et Musc which is the only one I can think of. I’ll have to go through my samples to see what I can find. There’s Jo Malone Blackberry & Bay. Yves Saint Laurent In Love Again is another blackberry rose, and I think the Bvlgari Rose Essentielle had blackberry too. I think of J’adore as having a blackberry note also, no? Also, Trish McEvoy’s Blackberry & Vanilla Musk; my impression is that’s the big seller from her line. Your comment reminded me that I have samples of both Mure et Musc and MeM Extreme. So, a dab on each hand. After an hour, I can confidently say that neither is for me, but I find the original more wearable than the Extreme. But both carry that dryer sheet musk. Sounds like something I’d like, but ad I not read this I would think it was a rose fragrance and yawn and move on. Like a true flanker it carries on the violet theme of the other Paris, but how would anyone know? Maybe they’re hoping the “Rose” will bring in some rose lovers since rose seems in vogue in these new releases? Also Robin always cracks me up with her “if a bottle came into my possession.” I love that! Ha! I suppose I’m trying to differentiate between this sort of middle ground (“won’t pay for it but I’d wear it”) and the much more common bottom of the barrel rating (“wouldn’t wear it even if you gave it to me for free”). Sounds very interesting. I’ll have to try it the next time I’m at Nordstrom. I am still lamenting the beautiful Florabotanica bottle but I refuse to buy as the juice is truly vile. It is rare that I really would buy something just for the bottle, but that was such a great bottle! That one, Fendi Palazzo and Pucci Vivara are the 3 I wish would come back with something else in them; just hate to see them go to waste. Guerlain Vega is the one I am glad came filled with fantastic juice. I absolutely love the bottle, but would never pay $300 for something that didn’t knock my socks off. Fortunately, or unfortunately for my wallet, Vega knocked my socks off. Feerie is the one I wish came with better juice, although I may eventually buy a bottle since it is available rather cheaply at the discounters. I think I’m one of the few that doesn’t like the Feerie bottle. Just as well, I didn’t like that juice either. You were certainly more positive about this than I. I was really looking forward to this, but it was a big fail for me. I rushed off to try it the first day my Nordstrom put it out. It was an airy, subtle, unsweet scent which is about the best I can say about it (as those are often good things for me). It started off a bit ozonic and grapefruity (I think that was supposed to be the blackberry I was looking forward to). Later it became more like the original with a little peppery violet musk. I couldn’t find the rose. And I much prefer the bottle for the L’Essence fragrance, anyway. So now I’m looking forward to trying the new Bottega Veneta Eau Legere. We’ll see how that goes! Sorry you hated it, and thanks so much for the opposing review! The BV just went online at Neiman Marcus, wish they’d had it when I was there. Wow, fabulous deal — congrats!